The world of Ducati Scrambler has already generated significant interest among fans. 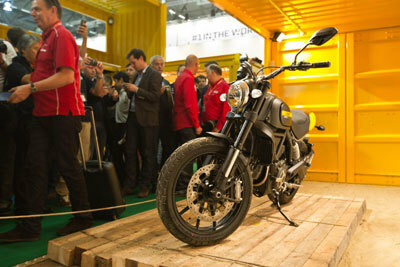 On Tuesday 30 September, the day the new Ducati brand was officially presented to the public at Intermot, fans took the scramblerducati.com website by storm to such an extent that they literally sent it haywire. The site went offline for a few minutes before becoming visible once again to the numerous visitors who connected from all over the world to see the four versions of the Ducati Scrambler unveiled for the first time ever at the Cologne motorshow. The Icon, Full Throttle, Urban Enduro and Classic Ducati Scramblers captured the attention of the large audience attending Intermot press conference, as well as the fans online. The four versions of the Ducati Scrambler have been developed from the concept of maximum personal expression and complete customisation and within a few hours of the motorcycle's unveiling, numerous interpretations of the Ducati Scrambler had already appeared on the internet. The Ducati Scrambler has even seduced The Dandy Warhols. The popular rock band from Portland were able to admire the Ducati Scrambler in a special preview and were keen to play an active role in the Ducati Scrambler project with the song “I am free”, which is the soundtrack of the Ducati Scrambler launch video shown in a world preview at Intermot in Cologne. The video is available at vimeo.com/107578971. As well as the Cologne event, Ducati Scrambler is present at the Audi stand at the “Mondial de l'Automobile”, the international car show in Paris. After featuring at the Volkswagen Group Night on 1 October in the run-up to the official opening of the event, it will be on show in the French auto show until 19 October. There is however much more to the Ducati Scrambler – a world full of fun, sharing and personal expression: over the next few weeks an extensive collection of apparel and accessories will be presented. For further information on the world of Ducati Scrambler just connect to the dedicated website at scramblerducati.com.